IoT is a catch-all phrase for the integration of the network with sensors, devices, big data and analytics. It is characterized by low-capacity communications. The industrial internet of things (IIoT) is an underpinning of the smart city. Machine to Machine (M2M) is another terminology to describe low power applications. There are a variety of standards trying to compete for spots in the IoT ecosystem, including proprietary and open solutions operating on a variety of spectrum. The following list is not an endorsement of any technology, but simply for educational purposes. Radio Frequency Identification systems use an RF signal and a tag to provide data that is either recorded or triggers an action. There are two types of tags: active and passive. The tag has an antenna and a microchip that either generate or respond to a RF signal. Bluetooth is technology that has been heavily focused on small area networks for private user connectivity. It operates within the unlicensed 2.4 GHz range and with the latest specification, is highly power efficient (Especially with Bluetooth BLE). Unfortunately, Bluetooth transfers are relatively slow, however, this could be about to change with the upcoming Bluetooth 5 specification. Similar to ZigBee, Z-Wave is a consumer-focused wireless protocol that uses mesh networking. It can be used to connect several in-home sensors and devices, such as climate and lighting controllers, security devices, and other automated devices. ZigBee is a growing technology used to create local area networks for home automation and consumer IoT devices. It also operates within the popular 2.4 GHz range, and uses mesh networking for better connectivity and device discovery. This standard uses a specialized type of internet protocol that allows for efficient communication over networks with modest bandwidth capabilities. It is an open standard and is becoming popular with smart- home automation systems. Thread builds on the 6loWPAN protocol, and has some similarities to the ZigBee network. It is continually being developed and improved by Google Inc., and is targeted at home automation and consumer IoT devices. The Institute of Electrical and Electronics Engineers (IEEE) created this standard for wireless personal area networks (WPAN). Various versions use different bands. For example, 802.15.1 uses Bluetooth to create a personal area network. This LPWAN competes with SigFox for the low-powered M2M communication that is essential for modern IoT devices and sensors. 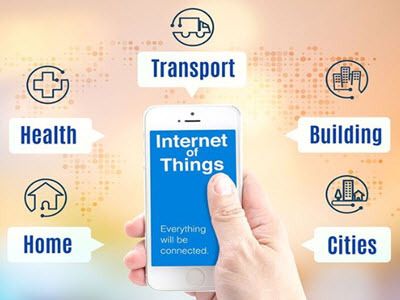 Devices connecting to an NB-IoT network could be battery powered for up to 10 years, making it suitable for remote stationary sensors in smart cities. LoRaWAN is another wireless protocol that aims for power efficiency, albeit at the cost of network speed. Although not suitable for low-latency and high-bandwidth applications, it is tailored for low-rate M2M transfers over wide-area networks.